Prayer Steps to Serenity The Twelve Steps Journey New Serenity Prayer Edition by L.G. Parkhurst, Jr.
that deals explicitly with the Christian implications of 12-step recovery." in Library Journal, May 1, 2006. Experience the love and power of God's Spirit! Praying through the 12 Steps in Prayer Steps to Serenity will help you enjoy lasting recovery, overcome obstacles, solve problems, find inner peace, and improve your relationships — one prayer step at a time. Prayer Steps to Serenity will help you maintain serenity as you receive God's love and power for overcoming addictions, compulsions, dependencies, or other weaknesses. Praying through the meditations on the Serenity Prayer in Prayer Steps to Serenity will help you find serenity through your daily reliance on God. Prayer Steps to Serenity will help you pray more powerfully and wisely for yourself and others as God's Spirit leads you to pray. During your 12 Steps Journey in Prayer Steps to Serenity you will experience the love and power of God's Spirit. Choose between the Recovery Edition and the Daily Quiet Time Edition! Praying and reading through Prayer Steps to Serenity seven days a week will help you practice conscious contact with God in your recovery as you work the 12 Steps and pray the Serenity Prayer (with 12 new readings on the Serenity Prayer). Prayer Steps to Serenity will help you learn to pray in your own thoughts and words as you listen to God's word speaking in your spirit, heart, and mind. Praying the short daily prayers through the 12 Steps in Prayer Steps to Serenity will change your life and the lives of others! Twelve weeks of daily readings on each of the Twelve Steps and the Serenity Prayer to help you pray and walk with the courage and the power to change through your daily conscious contact with the God who loves you and will give you peace of heart and mind. Weekly questions called The Twelve Steps Journey Workbook provides space for you to record your prayers, your answers to your prayers, and your responses to what you are learning from the Twelve Steps and the Serenity Prayer. Weekly Fellowship and Meeting questions called the Group Journey Guide to help you participate in or lead Support Groups, Recovery Groups, Prayer Groups, and Serenity Groups! The Serenity Groups website includes free easy-print Bible Studies and free Christian recovery 12 Steps meeting handouts. 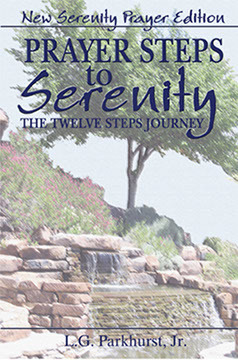 Prayer Steps to Serenity the Twelve Steps Journey is a recovery devotional guidebook for individuals and groups that presents the Twelve Step Spiritual Program from the perspective that helped Bill W. and Dr. Bob find and maintain their recovery and serenity. Through their daily contact with their Higher Power and scripture study, they not only maintained their sanity but with their caring and loving attitude they started the Program (A.A.) that has helped millions find recovery. 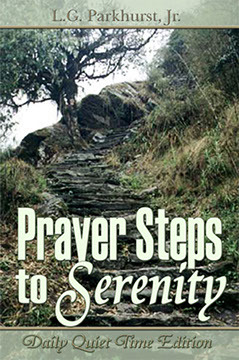 Prayer Steps to Serenity the Twelve Steps Journey is available from amazon.com and other online retailers. If you would like a very simple introduction to the Secrets of Serenity for you or someone else, consider Prayer Steps to Serenity: Daily Quiet Time Edition, which is also available in an e-book edition. © Copyright 2007-2016 by L.G. Parkhurst, Jr. . All Rights Reserved.